NEW YORK, USA -- Confused about what's been going on between Russia and Ukraine? You're not alone. 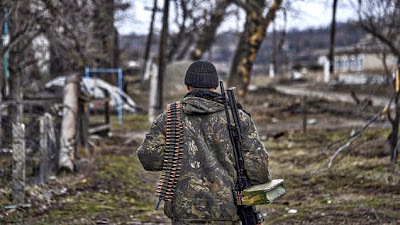 A pro-Russian rebel walks along their position at the frontline in a village not far form Luhansk, eastern Ukraine, Thursday, March 12, 2015. And that's sort of the point — this conflict serves as a case study in the effectiveness of shadowy, "hybrid" warfare, which is hard to understand from the outside. And the effectiveness of this strategy means it could be the future of global conflict. On November 21, 2013, Ukrainian protesters took to the streets to demand closer integration with Europe. Over the next several months, the scope of the Euromaidan protests expanded to include calls for the resignation of President Viktor Yanukovych. The government eventually succumbed to the pressure and fell in early 2014. Now, just a year later, Ukraine finds itself in complete turmoil. First, Crimea was annexed by Russia. Soon after, a pro-Russian insurgency erupted in the eastern regions of Donetsk and Luhansk, leading to civil war and thousands of deaths (the conflict is now on hold, following a ceasefire agreement). The Ukrainian economy, now in tatters, is buckling under the strain. Millions have suddenly found themselves displaced and disenchanted. This is how Russia is waging war against Ukraine — and this is how wars are starting to be fought. President Vladimir Putin has denied culpability, but experts say that he's actually waging a sophisticated "hybrid" style war — a multifaceted set of tactics designed to obscure intentions and confuse the enemy. It not a new idea, but it's a strategy that's quickly gaining traction in our highly globalized and interconnected world. What's more, burgeoning technologies are introducing an entirely new set of tools for waging these so-called "shadow" conflicts. There's suddenly a growing concern about how the West should respond to these tactics, and whether we can expect to see similar campaigns launched elsewhere. Hybrid warfare is defined as the use of conventional, unorthodox, and varied techniques as a means to sow instability in a rival nation. It's not necessarily a way to gain new territory, though it can be used for that purpose. Military analyst Frank Hoffman from War on the Rocks describes it as "any adversary that simultaneously employs a tailored mix of conventional weapons, irregular tactics, terrorism, and criminal behavior in the same time and battlespace to obtain their political objectives." According to The Military Balance — an annual assessment of global military capabilities and defense economics — the methods of hybrid warfare can include: the use of military and non-military tools in an integrated campaign designed to achieve surprise, seize the initiative and gain psychological as well as physical advantages utilising diplomatic means; sophisticated and rapid information, electronic and cyber operations; covert and occasionally overt military and intelligence action; and economic pressure. Contrast that with the traditional definition of war, which, according to the U.K. Army Doctrine Primer, is "the most intense form of conflict... an inherently confrontational, volatile, dangerous and chaotic violent contest." In fact, hybrid tactics aren't always violent. As noted, hybrid war has received attention following the recent Russian actions in Crimea and southeastern Ukraine. In both cases, Russia deployed a series of calculated campaigns designed to gain a unilateral and national advantage, and as a means to impose its political will, destabilize its adversary, and take territory. Currently, Russia is deploying hybrid war to (1) protest and circumvent Ukraine's efforts to join the EU, (2) destabilize its perimeter, and (3) to possibly claim new territory. On the latter two points, it's a strategy that harkens back to the Cold War, when the USSR used Eastern Bloc countries as a kind of buffer zone against NATO-led Europe. Hybrid warfare, as a blend of hard and soft power, utilizes a combination of tools, some military and some non-military. Together, they're used to wear down an opponent. But hybrid war is also ambiguous in terms of where it originates from and its actual intent. Consequently, it's hard for multinational bodies such as NATO and the EU to formulate a coherent and effective response. In southeastern Ukraine, Russia's use of hybrid warfare has steadily changed as circumstances warrant. Initially, pro-Russian rebels, trained in tactics and the use of sophisticated Russian weapons, were sufficient. Then, as Ukraine's forces responded, Russia amassed troops near the border to provide a relatively covert response. According to The Economist, around 4,000 Russian troops were sent to relieve Luhansk and Donetsk while simultaneously threatening Mariupol. Ukrainian intelligence suspects there may be as many as 9,000 troops in their country, with another 50,000 immediately across the Russian border. Ukraine is also accusing Russia of supplying the rebels with arms. Russian soldiers who are in Ukraine don't wear any official insignias, hence the term "little green men." Russia's state-controlled media, including RT, are also being put to good use. In its effort to discredit the Ukrainian government, Russia portrayed the country as a failed state, one regressing towards fascistic authoritarian rule and anti-Semitism. At the same time, Russia accused the West, particularly the United States, of spreading its capitalistic and political tentacles across Europe. The media is also being used to establish a narrative in which Russian minorities appear to be subject to persecution and discrimination by Ukrainian natives, and by a government it deems to be less than ideal. And when Malaysian Airlines Flight 17 was shot down by a Russian Buk surface-to-air missile on July 17, 2014, the Russian media accused Ukrainian forces of shooting it down. Almost half of all Russians bought it. Lastly, expanded use of strategic communications can be used to shape information campaigns directed at both domestic and foreign audiences. The Kremlin's denials and rebuttals have created, in the words of The Military Balance, "a sense of cognitive dissonance in foreign decision-making circles." Information technology has been put to use as well. Since the start of hostilities, the number of cyber attacks inflicted on Ukraine by Russia has escalated dramatically. These cyber attacks are said to be the product of "criminal gangs" and an impromptu force of independent "patriot hackers" and activists. While this may account for some of the activity, it's far more plausible that the attacks originated from trained state forces. Specific targets of these attacks have included various Ukrainian industries and even the education sector. They include attempts to damage computer systems, steal information, and spread propaganda online. Russia has also engaged in economic warfare, including the withholding of critical resources, like oil and gas. As early as 2013, Russia imposed an export blockade on Ukraine. All Ukrainian importers have been added to the "list of risk" by the Federal Customs Service of Russia. It's basically a blockade, one imposed by Russia as a way to put prevent the Ukrainian government from signing an economic agreement with the European Union. It's important to note, however, that in response to the annexation of Crimea and its meddling in southeastern Ukraine, both the EU and United States have imposed sanctions on Russia, as well as tightening restrictions on major Russian state banks and corporations. In addition to these tools, and as demonstrated by Russia during its annexation of Crimea, there's the integrated use of rapid deployment, electronic warfare, locally based naval infantry, and airborne assault and special-forces capabilities. Together, these tactics show that war can no longer be defined in conventional ways. It has become an extremely grey area — a kind of shadow conflict — in which the national government of Ukraine (as well as its allies), are pitted against separatists, Russian ultra-nationalists, and even ground troops. Hybrid war is not an entirely new concept, though it is being redefined and refined by Putin's Russia. As an idea, it's closely tied to what foreign policy researcher Michael Noonan calls political warfare — the suggestion that there's more to war than just violence and lethal force. The political scientist George Kennan has also described it as "the employment of all the means at a nation's command, short of war, to achieve its national objectives." As pointed out in The Diplomat, the "general practice of blending conventional state-on-state conflict with irregular warfare has been around for centuries." Indeed, in recent times it was applied to the Vietnam War (i.e. the use of military "advisors") and the Soviet invasion of Afghanistan. Very recently, Russia applied these tactics in Estonia (2007) and Georgia (2008). According to Frank Hoffman, the U.S. Marine Corps has been developing its own version of hybrid warfare for over a decade. The concept was derived from historical analyses and references in foreign literature regarding a deliberate blending and blurring of modes of warfare. The term was adopted in Service and DOD documents including the 2006 and 2010 Quadrennial Defense Reviews. Former Secretary of Defense Robert Gates and leading military intellectuals like Lieutenant General H. R. McMaster used this term to describe the complex and evolving character of conflict. The term has been used in Marine planning documents, Navy strategies, Army doctrine, and British assessments of contemporary conflict. It also appears in the National Intelligence Council's assessment of global trends. Over the course of the next few years and decades, it will be increasingly common for armed forces to work in environments where there are both the regular military and irregular paramilitary and/or civilian adversaries. They will also have to increasingly engage terrorists and criminals. Some experts worry that hybrid warfare, as a concept, will spread to other potential state or non-state adversaries, including ISIS, Iran, and China. It's very likely that all stakeholders are closely watching the situation in Ukraine to see how the West responds and adapts. And indeed, the so-called Islamic State has integrated a number of these tactics into their arsenal. This aspect of hybrid warfare was also evident in the media operations of ISIS in the Middle East. Fusing modern social-media savviness with sharp broadcasting techniques and even computer gaming to recruit, inspire and intimidate in equal measure, the actions of ISIS in this regard demonstrated some thematic similarities with the application of hybrid warfare in Ukraine, even if in another geographical area and a different operational environment. These similarities required an understanding that, while traditional military capabilities such as mobility, firepower and protection remain relevant and important, the application of force must also be effective on the 'battleground' of perception, particularly against enemies that can operate in and among populations and extend operations beyond physical battlegrounds to the realms of perception and subversion. Indeed, this hybrid, adaptable nature of ISIS proved key to its advances: it has been part insurgency; part light-infantry; and part terrorist group. There's also the potential for Russia to expand its current hybrid campaign to regions outside of Ukraine. Baltic nations in particular are preparing for hybrid war. This would be particularly problematic because these countries — Latvia, Estonia, and Lithuania — are NATO members. Any incursion into any of these nations, all of which contain sizeable Russian minorities, would be a severe test of NATO Article 5, which regards an attack on any member as an attack on all. As noted, the apparent defense of Russian minorities in other countries is an important aspect of Putin's hybrid war. By circumventing extra-national governments and constitutions, Russia is testing the limits of international law. This past January, former NATO secretary-general Anders Fogh Rasmussen said there was a high probability that Putin will test Article 5 in the Baltics, but that "he will be defeated" should he do so. Disturbingly, Russian military planners may be lowering the threshold for using nuclear weapons in any conflict; as reflected by the cover story of this week's Economist, we are entering into a new nuclear age. Interestingly, hybrid warfare as a tactic may be aided by the ongoing threat of limited nuclear strikes. To address these threats, NATO and its allies have been advised to invest in long-term strategic-intelligence capabilities, and to develop better law enforcement, information, and financial tools. At the same time, armed forces still need to be effective over air, land, and sea. Basically, governments and their forces need to invest in a wider array of capabilities while improving coordination between them. It's also important that they foster the development of strategic communications, much like Russia is doing with its state-controlled media. Regardless of how the West responds, however, it's clear that war can no longer be slotted into tidy categories, or differentiated between "hard war" and "soft war."